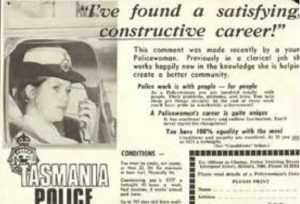 Recruitment of women to Tasmania Police was initially motivated by the desire to give some “friendly womanly advice” to young female offenders to set them back on the right path. 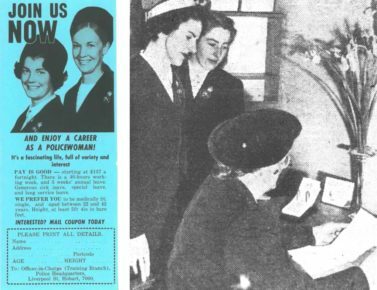 Twenty-five years later in 1942 there were just three women employed as police. Their work was completely separate from the work of male police officers and they were paid about a third less. A story in the Hobart Mercury in August 1952 calls for a seventh “lady cop” to join the force, to be stationed in Burnie. The article said policewomen face “danger in a dozen ways” and described the ideal candidate as “firm and kind, discreet, tactful and something of a philosopher”. Head of the policewomen for the state, a Mrs K Field, says in the article: “Policewomen’s duties often involve the handling of sordid situations, where they may see life’s tragedies and its complexities. They act as mother confessors to unmarried mothers and girl delinquents and advise with their domestic problems”. By 1960 there were 10 female police officers employed in Tasmania. Recruitment ads in the mid 1970s described policing as a “satisfying and constructive career” and providing a “fascinating life full of variety and interest”. The images in the 1970s advertising show a police woman using a radio – a more operational role for women police officers – and boasts that women have 100% equality with men. Applicants had to be single, aged no younger than 22 and no older than 42. Top: Recruitment advertisement from the 1970s featuring Constable Jan Rowell. Above left: A recruitment ad from the 1970s describes policing as a “fascinating life” for women. Above right: An article in 1952 calls for a 7th Lady Cop to join the force, (courtesy of The Mercury). This page -- https://www.police.tas.gov.au/about-us/100-years-women-policing-tasmania-police/recruitment-and-training/recruitment-campaigns-targeting-women/ -- was last published on January 23, 2018 by the Department of Police, Fire and Emergency Management.